Plans for the Million Dollar Challenge? As I've mentioned, I'm fascinated by what psychics and mediums do. I've long been convinced by the academic research that it's a real process. But how does it start? What exactly do they experience? Not being psychic at all, to me mediums seem like a different species. Many of them say they've always had the gift, that as children they saw dead people, and assumed everyone did, and so on. They're so much part of the whole psychic spiritualism thing, with its jargon of 'energy' and 'vibrations', that it takes an effort of will to enter into their world. Some small part of me still thinks it's all made up. But what if someone who is very much part of the real world - if there is such a thing - were to cross over? Doctors, for instance. I've always considered them to be a highly sceptical bunch, having been trained in the rationalist, problem-solving scientific tradition. Years ago I recall visiting my local GP about a minor complaint carrying with me a book about psi research. He commented on this, having just read somewhere that ESP had been definitively debunked. (I believe it was an article by Susan Blackmore, who was pretty much everywhere at the time.) He wasn't hostile, but I got the sense that it would be pointless trying to convince him otherwise. Rubenstein's experience started in his surgery one day when a patient having his blood pressure checked suddenly said he had a man with him, and he wanted to have a word. The doctor had previously had no idea that this patient, a public relations whizz in the entertainment world, had anything to do with spirits. But went along with it, and to his complete astonishment the man then channelled his grandfather with a 20-minute discussion about Rubenstein's personal life. Rubenstein subsequently learned this was something that he should be doing too, and started having powerful and accurate intuitions. He talks about receiving what feels like a 'tug' or even a 'slap' on the back of the head. This happened once when he chucked his car keys on the table just as he was going out, knowing he wouldn't need them; he felt a slap and a verbal warning to take them or they would get stolen. He ignored it, the keys were stolen, and all kinds of problems ensued. In one particularly striking incident he hears from an acquaintance at the gym that her grand daughter has swallowed the plastic cap from a pen. It's assumed to be in her digestive system, but Rubenstein has the strong impression that it has lodged in one of her bronchial tubes, which would be much more serious. He convinces the woman and her daughter to have the child tested, but x-rays show nothing wrong. Having spooked them completely they insist on further tests in a major hospital. Still nothing seems amiss. Finally, to calm the frantic women, a doctor suggests pushing a bronchoscope tube down the girl's windpipe. That afternoon, the doctor looking after Kirsty extracted the chewed cap of a red plastic ballpoint pen from her right main bronchus. Because she'd chewed it, the plastic cap had frayed into little barbs so that it had begun to embed itself into the wall of the bronchus. It was unlikely she would have been able to cough it up. The consequences of it being left in her lung for any length of time would have been disastrous for Kirsty's health. She would have developed pneumonia or possibly even a serious chronic lung condition called bronchiectasis. A useful come-back to the 'what good does it do?' complaint that sceptics always make about psychics, methinks. Encouraged to go into it more deeply, Rubenstein joined a training circle at a spiritualist church. His first experience at the circle involved sitting in a circle and trying to focus on the first image that came into his head - as he says, the complete opposite of what they teach you at medical school. But he quickly discovered that the images were meaningful to other people. The figures he saw, and the situations they described, were understood and accepted by them, with a level of detail that makes any kind of chance or Barnum effect implausible. In my mind's eye, I could still clearly see Jane, standing behind Hayley. But behind her I became aware of an altogether more shadowy presence. This was a woman, older than Jane, with gray hair and wearing a floral dress. She was smiling and had her hands on Jane's shoulders. Then the image changed and became more vivid. I experienced the startlingly clear vision of a crystal chandelier, which took up my entire inner field of view. It radiated a powerful light and I could clearly see rainbow colors refracted from the cut crystal. With that, I felt I'd suddenly been handed a vast amount of information about this woman; as if she'd somehow dropped it into my head, all at once. I heard myself saying, very quickly, "I can see a crystal chandelier. There wasn't just one - she had lots of them. Her house was full of crystal chandeliers. She was very proud of her house. It was always neat. She was very close to you. I think she was your grandmother or maybe your grandmother's sister. She had a stroke and was incapacitated towards the end of her life... Then I started to splutter... I felt an intense happiness welling up in my chest. It became impossible to contain it and I burst into tears. Everyone in the room was looking at me. I couldn't help it. I was overcome with emotion. Then I lost the connection. It just went. I could remember what I'd seen but the vividness of the information was not longer so apparent. The emotions I'd been feeling had suddenly disappeared, as if someone had thrown a switch. However, the image of the crystal chandelier remained very clear - I can still recall it. Hayley was looking at me intensely. "That was my aunt. My great aunt. You got her exactly right. And she loved crystal chandeliers. But the best bit is the fact that you're crying." "Why?" I asked. I felt extremely foolish. I hadn't cried in public since I was a child. "Because nine years or so before she died she'd had a stroke, like you said. It affected her brain. She became much more emotional. She used to cry whenever she was happy." I was pleased but I felt as if I'd been put through the wringer. My headache was back and I was completely drained of energy. The book is breezy like a novel, written largely in dialogue, which makes it an easy and entertaining read. As I say, it's informative about the process of becoming a medium, and I really recommend it. But more than that, it's also an important book. Rubenstein has shown how it is possible for an ordinary non-psychic member of society, someone who in his professional work is embedded in rationalist thinking, not merely to adjust to psychic intuition when it arrives unbidden, but to learn how to use it for the benefit of others. Thanks. I've seen the book advertized and was curious about picking it up. Since you say he is a London doctor, have you come across any media mentions of him? Any substantiating testimony? Thank you for this. Very interesting. The element of someone "crossing over" (loved that pun) from the medical world to the realm of mediumship is a powerful one. I do think there is a greater openness in medical doctors than in many other scientists, especially psychologists. Doctors, on balance, seem to have more of a focus on whatever helps the patient. I'm currently reading a book with a similar (albeit weaker) crossing over theme, in this case, a doctor investigating near-death experiences: Pim van Lommel's Conscious Beyond Life. Right now I'm reading his survey of the skeptical explanations of NDEs and it is stunning, really, just how little those explanations make a genuine attempt to honor the evidence. Excellent review, Robert! Have already bought the book and will begin reading it very shortly. Strange but very true that we all seem to need some outside authority to confirm what we already know in our hearts is true about psi. Thanks, Robert! Sounds exactly like the kind of book I most enjoy, one written by a smart but skeptical person, gradually opening to the world of spirit. Because . . . well, that's MY story. Gonna pick this up pronto! You're right--the fact that he's a doctor, with the sort of conservative reputation that implies, adds a lot. Which reminds me of how eagerly I'm awaiting Eben Alexander's book. Not so far. I was going to say I'm not surprised, as the British media seldom pays attention to books on psychic and spiritual subjects. But this one might pick up some reviews. "As I've mentioned, I'm fascinated by what psychics and mediums do. I've long been convinced by the academic research that it's a real process. But how does it start? What exactly do they experience?" Hi Ian, great book. I have a general question. I'm curious about what makes a medium. Is it something you're born with, and which might be latent until it emerges in mid-life - as in your case - or do you think it's something that potentially anyone can learn to do? Is it something to do with temperament, psychological or neurological make-up? Hi, Robert. I’m glad you enjoyed the book. My view is that we can all probably do this to some extent. I’d expect that, as with any human ability, there is a natural range or normal distribution across a population, with some outliers at either end of the range. I mean, we can all kick a ball, but not everyone can be David Beckham. What do they say? 1% inspiration, 99% perspiration. I’m a pretty enthusiastic kind of person. I tend to get a bit obsessed and focused with what I’m doing and I put a lot of effort into trying to get a handle on whatever I get my teeth into. And there’s plenty to get your teeth into in the paranormal field! When this all happened, the NHS GP contract had just changed and for the first time since the age of 22 I no longer had to do variable on-call work. I finally had regular time out of hours which I could devote to classes in the evenings. Attending the psychic development circle was like a breath of fresh air. But actually, looking back, it involved a lot of effort, but not the sort of effort I was used to making. I had to make an effort to “let go”. Temperamentally and psychologically I do tend to rely more on logical analysis, but of course I’ve now discovered that I have this whole other side to me that I had kind of suppressed. Or maybe it’s just living and working within a Western rational framework that tends to suppress this side. Of course, there were also deep psychological factors at work within my psyche at the time of my “awakening”. Not least, an absolute flaming family row which caused me and my wife to fall out with my parents and my sister. I was very miserable and hurt for a couple of years before I “opened up”. There was an awful lot of suppressed psychological energy released. All very Jungian. As regards a neurological propensity to psychic phenomena, you would probably be interested to know that round about the time I started having these experiences, one of my teenage relatives also started hearing voices and became convinced she was psychic. Now, especially because of her age the fear was that she had developed schizophrenia. But it turned out she had developed temporal lobe epilepsy. There’s always been this link between temporal lobe epilepsy and religious/spiritual phenomena. Could there be some form of temporal lobe instability, maybe on my father’s side of the family? Perhaps I have this in small part and get the benefits, but my relative is unlucky enough to have a full-blown example. Mind you, she is convinced that she does get psychic impressions. And, in case you're wondering, no I haven't had an EEG to see what's going on in my temporal lobes, GPs can't just order these things up, unfortunately. Yes, the link with temporal lobe epilepsy keeps coming back. This interests me on a personal level, as I've suffered from it myself, and still take medication to control it. I've never had hallucinations or anything that might qualify as a psychic vision (at least as far as I can recall) - just rather unpleasant fits. I've always thought that my interest in psychics and the paranormal was a purely rational response to other people's testimony. But sometimes I wonder whether there is more to it than that. Something I write a lot about on this blog is the difficulty that many people have accepting the idea of psychic phenomena. I'm curious about the reactions you get from other people, particularly professional colleagues. Is there resistance to it? And do you find it awkward, or do have strategies to deal with it? I have x-ray vision in that I can perceive, see) into the physical body of another person near me or thousands of miles away. I perceive the location of the illness in the body. Also the condition of the bone structure, organs, etc. And at the microscopic level as well as needed. I am a Pastor with the Gifts of Spirit. Also the healing gift manifests in various ways. And so on. Just sharing. Ian-What have your experiences lead you to believe in terms of an afterlife and general psi phenomenon? Thanks! Dear Ian- My co-worker, Donna A., has a very deep cough and sharp back pain that I fear may be related. she has had this cough for months and doctors claim it's allergies. Can you tell see a cause for her problems? Ian, looking forward to reading your book. Glad you understand about the different levels of consciouness so you might be more helpful to your patients, especially those who have major health issues and concerns. Was wondering if you could get an impression of an eye ailment I am currently experiencing. Does your doctor guides have any suggestions as to how to treat it? Thank you in advance for a response. If you choose to email me (hweissri@aol.com)that would be great. Robert: You have to understand that when all this started occurring I was absolutely gobsmacked. I’d been writing computer code intensively for the past seven years, and all of a sudden all this weird stuff had started to break into my life. And not just my life but it seemed to drag in my family, friends and even my patients. It was so amazing that I couldn’t stop telling everyone about it. I remember going to one medical meeting and speaking to people there when my own GP came up to me, took me aside and whispered to me “I’ve been seeing angles all my life, especially beside the beds of dying patients, but I’ve never told anyone about them. Probably best if you kept quiet too”. And if it has just been hearing voices and just personal stuff, I’d have probably sought psychiatric help. However, I remembered what my old boss told me when I was doing my psychiatric house job as a GP trainee. I’d mentioned about the transfiguration I’d witnessed as a student, and asked him how my experience was different from some of the things the patients mentioned. He explained that psychiatric patients were dis-eased by their experiences, whereas, if anything, mine had made my life more interesting and hadn’t seemed to adversely affect me. So I reckoned that I probably wasn’t going bonkers, especially as quite a lot of the stuff I was getting seemed to be confirmed by others. In 2005 I actually wrote an article for the an in-house magazine of the Royal Colleges of GPs about my experiences in my psychic development group. No-one took much interest. I have to say that, so far, my patients have been intrigued by it all, and my colleagues at the surgery have been very supportive. We have a nurse and a receptionist who have had psychic experiences and one of my medical colleagues has also had some spectacular psychic experiences, too. My medical colleague and receptionist are both devout Christians, and find this stuff difficult as a result, but they do recognise it as being valid, though question its source.. It occurs to me that nobody speaks about these things because they think that everyone else will believe they are mad so it’s kind of like one of the few taboo subjects amongst educated people. There are very few doctors I’ve come across who make derogatory comments. Even those who are openly sceptical have been very polite and even friendly towards me (so far). I suspect that it’s partly because I don’t do “belief”. I take a Fortean view which I believe is the most truly scientific view: I offer up my experiences as material. I merely hypothesise and am interested to hear what other people think of my experiences in the nature of good-natured and open-minded enquiry. I have doubts about my experiences, which I’m happy to talk about. But I still think my experiences are valid. The other thing is, of course, that I do like to celebrate the complete nuttiness of the whole field: the way it gets you off-balance, constantly wrong-foots you. I think it’s hilarious and wonderful. So I like to laugh about it, too. While I do take this subject seriously, I try not to take myself too seriously. Robbie: for a variety of reasons I think that they may well point to survival of the personality after death, but I am prepared to entertain other possibilities. For the moment the best way of getting a handle on these experiences, practically speaking, is using a spiritualistic framework. It’s the simplest and most easily understood hypothesis, and most people, even if they aren’t comfortable with the idea do understand it’s basic premise. If you want to go deeper than that, then you have to begin to question your basic assumptions. For example, materialists talk about consciousness as being a mere epiphenomenon of the brain i.e. a physical system. But since the only first hand experience we have of anything at all is of our own consciousness, one could equally argue that consciousness is primary and physical systems are “merely” epiphenomena of consciousness! Herb & Pattie: I’m sorry but I cannot answer any direct medical questions here. This is not the place because I really would not be able to do a proper job! I have deliberately kept away from mixing diagnosis and treatment with mediumship. It’s probably worth explaining why so here goes! While I have read some astonishing accounts and witnessed a few things which have been intriguing, I feel that I need to keep some semblance of professional boundaries intact. After al, you can guess that I’m so far out on a limb with mediumship as a doctor and with this book I’m like one of those caryoon characters busy swaing the branch off that I’m sitting on! But I'm a western medical doctor and that's my job. That's what I'm paid to do and that's what my patients see and expect of me. When I pass on information to my patients, I always explain that, look I’ve had this training as a medium, I sometimes get insights which may be useful, but I never foist any particular interpretation onto what I’m doing and I always ask if they are comfortable with me doing this. Spiritualists believe that we all have healing guides who work with us. If that’s true then that’s great: they can point me in any direction that will be beneficial to my patients. But I think it’s important that, when it comes to diagnosis and treatment I keep a clear distinction between my hard-won medical skills and my mediumship training. I’m happy to have any help available from wherever, if it’s beneficial to my patients, but it’s important that it’s separate from my diagnostic and treatment skills as a doctor. The other reason for keeping them separate (apart from the obvious professional dangers), is that when it comes to healing, even if you get a good result, someone can always say “well it would have got better anyway, there’s always an outside chance of this getting better” so you never are really sure what is going on. However, with mediumship you get (usually) instant feedback. You are either right or wrong and you know immediately. Well, that’s the theory, anyway. Of course things aren’t always as black and white. But for me this is a personal journey to find out what it’s all about—do we survive death? Which is why I find the giving of messages so interesting. One other reason for not consciously using mediumship in diagnosis is that, well, that I do not consider myself to be a particularly good medium. My book is not “Hey look how wonderful I am!”, it’s more “Hey, how did I get into this and can we all do this?” The fact that I seem to be able to do this in some small part completely shakes my rational medical-scientific foundations. But it is certainly not reliable, and like all people who go into this field, you are often baffled and wrong-footed. Now, the practice of medicine often baffles and wrong-foots doctors. But throw in confounding factors such as variable psychic impressions into diagnosis and I fear it would just muddy the waters! Where I believe mediumship is useful, however, is in help with bereavement counselling and cases where people have major shifts in their life circumstances. As a GP I see a lot of this, and of course standard biomedical medicine has little to offer such cases. So we are getting more into the realm of counselling here (and I do a lot of this). Having said all this, in my book is an example where I suspect I might have been guided by psychic intuition to help a friend’s granddaughter! Which just goes to show that any limits you try to impose on this stuff is merely a way of trying to get a handle on it and be more comfortable with it. But it seems to have a mind of it’s own! Rick: Well, I suppose there’s good and bad in everyone, and if there genuinely are spirits, I don’t suppose there is an amazing and instant transformation post-mortem. Also, if the universe is stranger than we can imagine, why not allow for various different sentient spiritual creatures. That’s why Spiritualists always ask for protection from the god of their understanding, and their personal guides. Of course from the Christian perspective, all of this is off-limits. Personally, the major problem I’ve had with using this is that it can be tiring, especially when you are busy seeing patients. Ian: I understand completely and thank you for your reply. Ian-Thank you for your reply! Reading your reply to Robert I find it it interesting and not at all surprising that alot of people have had these experiences and not spoken about them. You being open about them and being part of such a respectable profession, might encourage others to be more open about them, which is surely a good thing! I also admire how you are skeptical of your experiences, yet you don't dismiss them either! What do you think would be alternative explanations for your experiences? One always has to be honest and consider that it's all just a load of hokum, random coincidence and basic psychology. Researchers such as Richard Wiseman perform a valuable service by showing just how gullible people (including me) are and how easily people read into things that they feel may apply to themselves the so-called Barnum Effect. We receive a lot of information about people via many “normal” channels: body language, the words people use and, who knows, maybe even pheromones! And as a GP seeing up to fifty patients a day for the past thirty years, I’d have to be very stupid indeed not to have worked out what makes people tick. I’ve always been interested in the mind and taught myself hypnosis when I was 15 years old and have used it clinically. Maybe I’m doing an unconscious Derren Brown. I’d certainly love to know how he does it! I mentioned that not everyone can be a David Beckham and I am certainly no David Beckham when it comes to mediumship. I have done platform mediumship and it’s really nerve-wracking. Whatever I’m doing with patients is nothing like that. In one-to-one situations, there’s always feedback from the person you are giving the reading to. In that situation, even if there is a supernormal channel of information being used, you are bound the get “contamination” from more conventional sources. Plus I've known a lot of these people for many years. They may well have told me things that I don’t remember but are lodged away somewhere in the back of my mind. So, already I’m less impressive, eh? So, even if the “sceptical me” is correct, maybe I’ve stumbled upon an unvalidated form of counseling which may or may not bear scrutiny. At one level I see it as getting back to the roots of my profession, which started as shamanism. We’ve become so “scientific” (a lot of it is “junk science”) that we forget that medicine is a craft whose practitioners use skills derived from the arts and humanities as well as science. Science and technology is important, and there’s a bit of me that can’t wait for “Star Trek” medicine, nanobots and all the other wonders that they say awaits us (especially as I get a little creaky sometimes). But at the moment I feel that the tail of junk science is wagging the dog of medicine. I guess I see my book as my small attempt to redress that balance. Which is why it’s deliberately anecdotal and a determinedly non-scientific account. In other words, these are my genuine experiences. I may not be able to justify them scientifically, but they have value, at least to me, and they may be of value to my readers, too. So, that’s 25% of me done with. What about the remaining 75%? Based on my personal experiences, plus reading the literature and from the personal accounts of my patients, this bit feels that there is definitely an extra “privileged”, or supernormal, source of information. For example, just two days ago a patient was telling me about her deceased mother. She died at the age of 98 and I’d never met the mother. Just as the patient was about to leave my room I received a mental vision of “walnuts”. That was all. I hesitated to say anything to my patient as I was busy and tired. But, well, I sensed it was important. So I mentioned this to my patient, who then went all misty-eyed and said that her mother was inordinately fond of walnuts, and she had many happy memories of pickling green soft-shelled walnuts with her mother. She found the fact that I’d mentioned walnuts very comforting. And I’m very sure that we’d never talked about walnuts in previous consultations (why would we?). This is not great mediumship and not a particularly great message. I’ve heard more impressive ones on platform. But, having gone through my training, I’ve learned to trust myself enough to mention these things to my patients. Also, did you know that I practice in Enfield, home of the famous Enfield poltergeist? One of my patients actually witnessed this first-hand and another is closely linked with the case. I also interviewed Maurice Grosse, about a year before he died. If nothing else, I feel that this is a very convincing case. So I do have lots of reasons for taking Psi phenomena seriously. Of course, at this point “skeptics” walk away, shaking their heads and laughing. To them it must be akin to asking how many angels can dance on the head of a pin. So let’s ask them to close the door on the way out and discuss angels and pinheads. If there is survival, and surviving personalities are able to communicate via mental channels, then that presupposes that ESP exists. Accepting that as a given, the next question we need to address is this: where does the information given to mediums come from? And it’s that old chestnut: is it Super ESP or Survival? And here I vacillate. The problem is that the Super ESP theory is so all encompassing that it can explain everything. The cross-correspondences seemed to me to be a pretty good attempt to get around this. The problem is, they are so erudite and steeped in classical scholarship, it just doesn’t seem compelling enough to most people. To put a figure on it, I’d say that two-thirds of my less skeptical part accepts that Survival is the most parsimonious explanation of mediumship. Maybe the remaining one third prefers Super ESP. Probably because “spirits” seems so positively medieval whereas Super ESP seems somehow more “scientific”. For various reasons, though, I suspect that Super ESP may well imply some form of survival of the personality. Let’s take a very simplistic and strictly physical hypothetical example: neurologists such as Damasio have described work where they believe that consciousness depends on the recruitment of neurons across a whole brain. It’s not the individual neurons, but the way they are recruited into a self-sustaining pattern. As I understand it, they would view it as something like a tornado, or a flame. Its composition changes as material flows through it, but it remains a definite entity with its own characteristics. Likewise, neurons are switched into and out of a self-sustaining network of electrical activity within a single brain. Now, let’s assume that ESP is real and that brains really are linked into some sort of (wireless) network. One could envisage evolution selecting for the ability for patterns to migrate across the network if there was a survival advantage to the species. When we say that the departed live within us--maybe they really do! By the way, I don’t necessarily believe this: I’m merely throwing out ideas to show that Super ESP of itself might imply Survival. I could go on but Sheldrake expresses this stuff much more eloquently than I do, however. And he’s much cleverer! Ian-wow what a eloquent thorough response! I appreciate the time you took to write that, from what you've told me, it seems like you're definitely picking up information from non 'normal' means, though its best to explore all 'normal' possibilities first, which is what you seem to do. Have you or would you consider doing an interview for Skeptiko? (Skeptiko not Sceptico!). They get some really good discussions going on the forums there and you might get different feedback and viewpoints of your experiences, which is always useful! Anyway, thanks again for your responses! Robbie: You must be psychic! I'm doing an interview with Alex from Skeptico the week after next. Oh dear, how embarrassin, Ian. I just - an hour or so ago - posted on the Skeptiko forum to ask Alex if he might do a podcast with you! Oh and I look forward to it! Will be buying your book next month after I get paid aswell :). Ray, Robbie and Julie: Thanks for your support. I hope you don't find my book too anecdotal. I deliberately kept away from theorising in it as I had my patients in mind when I wrote it. I've talked about some of the more theoretical aspects of what mediumship implies to some people. But mostly their eyes glaze over and they say "what on earth are you going on about?" even those who are firm believers in the paranormal. So it's nice to be able to discuss this stuff with people who have also considered the possibilities. jshgfcre98ijyds: I followed the links you posted. I enjoyed reading about your experiences. It just goes to show that mine are definitely not unique. And it's interesting how, like me, you had strange coincidences which led to your joining a development group. Ray-Cheers! I try to add positively to these discussions when possible! Hopefully we'll run into one another on these forums more in the future! Anyway, the gist of the missive was that I greatly enjoy anecdotal accounts (at least the intelligent ones) and can identify with some of your experiences - in particular the occasional urge to say something that, on face value, seems incongruous but turns out to be significant to the recipient. And while I haven't yet finished reading your book, I'm very much enjoying it and feel delighted to have made your acquaitance. Julie: I had some trouble with TypePad too, some of my comments disappeared as well. You can reach me on facebook, or email me via my website. I just want to thank Dr. Rubinstein for his up-front and courageous acknowledgement of his gifts. I am also an exceedingly logical person with a strong tie to the metaphysical. It's not always easy to endure the criticism especially the jokes. But the experiences are undeniable, vivid and if one is not awake when the experience begins, they will certainly be confused about the experience and their state of mind. My apologies, Dr. Rubenstein, I have a brain, I put it in this morning, honestly, but sometimes it takes little vacations all its own. Aaaaggh! I wrote a fairly long message, and posted it into the ether, not realising my internet connection had broke. Firstly could you help up us to visualise in any terms we'd be familiar with from every day life what exactly seeing and hearing in the context of these incidents consists of? You're talking to a patient/sitter and see a grey haired man with a long moustache and he says "tell maureen not to worry" ...for example... Does he appear to be visually, externally, solidly in the room in front of you, in a manner akin to, well, Maureen herself, or what one would imagine an hallucination must be like: ie indistiguisable from solid external reality? Or is it a fleeting out of focus memory/imagining type mental image...such as when perhaps I type the word "dinosaur" and though your eyes are looking at your computer screen some kind of visual representation of a dino has just passed through your mind? Are the words/messages you hear akin to someone literally speaking into your ear, or just random-seeming internal thoughts? Or is it a 3rd type of experience that most of us simply can't find an every day equivalent to? The second question is to wonder if you can - whilst not being able to speak for anyone else, let alone professional/stage mediums - give some insight or explanation into the widely percieved and just as widely witnessed routine that breeds scepticism and suspicions of cold reading when seen on television: that is - pardon the crude exageration - "I'm getting George..or Georgina..Geraldine? Definitely a G.." followed by a full flow conversation full of personal anecdote, memories and conversation. The question always then arises how is the apparent spirit able to tell you where Aunty Maureen hit the biscuit tin containing her false teeth, yet not simply identify himself unequivocally as Alexander Ramsbottom, or whoever, with the same conversational clarity? From your own experiences does this seeming contradiction occur and is it easy to explain? Or is it unfamiliar to you and perhaps make you somewhat suspicious of the veracity of others who perform on stage/television? Perception is more easily explained. Here I’m discussing mental mediumship, rather than physical mediumship. That is, what the medium sees and others can’t, rather than physical manifestations which anyone can see. There are basically two types and the terms can be a bit confusing. But we are stuck with them. 1. Objective clairvoyance and clairaudience. When this happens it is exactly as if the person is in the room with you. I don’t get this commonly. In fact, I think I’ve only had it on one occasion with clairvoyance and one occasion with clairaudience (which was very striking). In other words, even though only the medium can see/hear the communicator (so in that sense it is really subjective) to the percipient, it appears to be “out there” in the real world. 2. Subjective clairvoyance and clairaudience. This is something which you’d be familiar with. It’s merely a development of one’s inner voice or mind’s eye. In other words, it’s a form of active imagination. 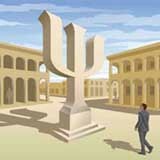 We are used to thinking of imagination as a faculty used in the production of fantasy. But of course, it can equally be used for other things: I mean, what did we do before we had computer simulations? In this case you are using it as a channel for, hopefully, communicating with the departed. This is how I work, usually. 3. This is more difficult, but you sometimes get a sort of weird admixture. You might feel that you can dimly perceive something with your physical eyes, but at the same time get an image with your mind’s eye. My working hypothesis is this: it is quite probably that, neurologically speaking, reality is a mental simulation. In that case, it’s all a mater of how good the simulation is. If we have privileged information from anomalous sources, we have to fit it into our mental model. Some people are better than others at doing this. Those who are very good experience objective communication, those less good subjective. And sometimes it fluctuates between the two. On this basis, when a medium says: I see Aunty Peggy standing behind you, she isn’t really “there” in any positional sense, it’s just how the information is presented to the medium. Of course, this neatly ties in with current ways of thinking about the brain. The problem with that is that these current ways might be in error. And there are instances of more than one person experiencing a “presence”, which kind of stretches it to some sort of consensual hallucination (and then we’re in Matrix territory!). However, as a working model to understand what one is doing, I favour this. In fact, when I’ve done platform work, I imagine that I am projecting holograms of my communicators out into the congregation. This area always has caveats though. I was always intrigued by mediums who tend to give positional pointers in their readings (so and so is standing to your left, your father’s always at your right shoulder). But I have to say, communications often do come with a very strong positional “feel”. It’s very striking. Whether this is just the way one’s brain makes the information more manageable or whether there genuinely are communicators positioned at those locations has to be moot. Of course, some would say this whole subject is moot! Names are a big problem for mediums. The only medium I met who didn’t seem to have a problem with names was my patient Lynda Nixon. I was in circle with her last year but unfortunately she died. Lynda was completely clairaudient and claimed that she heard things very clearly. 1. I would guess that, as we are visual creatures, most mediums are better at using their mind’s eye rather than “mind’s ear”. 2. The method of communication doesn’t help. You see, I don’t think that it’s the same as listening or seeing someone when it comes to mediumship. I rather gain the impression that the purported communicators tend to use what is already in the medium’s mind. So it’s a case of, somehow, the communicator rummages around trying to find the nearest image or impression that might convey their meaning. I think this is very important, and I think it has to do with trying to communicate across a very narrow bandwidth. To take the computing/communications analogy further consider the following. An uncompressed (or even a compressed) music file is very much larger than a MIDI file. They both play music, but the MIDI file only has to tell the instrument which notes to play (a bit like the old automatic player pianos), whereas an mp3 or other music file has to actually specify the waveform of the sounds. A MIDI file is more efficient, but if the instrument is less than perfect the wrong note might get played. I think this is a good analogy because, of course, in the old days communicators would actually call the medium their “instrument”. Now, I think the same problem occurs with visual imagery, but because we have a richer visual imagination (generally) and are more visual creatures, there is a larger set of pre-formed images for communicators to work with. I had a reading with medium Georgia O'Connor 2 weeks ago and she fired off names like a woman possessed (no pun intended)! She not only provided names but matched a specific health problem that my deceased grandmother was worried about with my mother. I was very impressed, considering that I did not even know about the problem but later confirmed with her. That would rule out telepathy but does not rule out super psi. I was so intrigued by the evidence that I scheduled another phone session with her to collect more evidence. She said she she can hear names but my next reading I plan on asking her more questions as to how she receives the information. Very interesting. 2)Have you ever considered putting yourself up for any scientific testing? Ray-I had a reading with Georgia a couple of days ago, suffice to say yours sounded much better then mine. She got some 'hits' but nothing that really hit home. Her misses concerned me, for example, talking about my mums dad saying he was there, when he's still alive and well! And saying names that meant nothing, but to be fair she said my mums name, her maiden name, one of my grandmas name, and my sisters name, and correctly said my sister and grandma share the same name. But a few of these names she just said, and I had to say who they were. And some of the information she said, you can get from googling my e-mail address, or possibly from my facebook. Overall I wasn't that impressed, and certainly wasn't blown away by any means. I kinda felt like I was talking to a fake, but maybe I had the wrong attitude, or it was an 'off day' for her, you and Michael had great readings with her, and I can't just discount that! Ian-When I say non envious mediums, I mean people that aren't mediums and are jealous of what you can do, not people that don't envy what you can do! Robbie. Yes absolutely. I do get misses. Also it must be true that people read more into what you are saying. And this is where the sceptical me pops his head out. However, there does seem to be a process of some sort at work here. I just seem to be coming out of a prolonged period (9 months or so) of getting absolutely nothing right. At this time I've been working hard (at the surgery, my book, family stuff) and I've definitely been feeling tired. Stuff I've given out has been met with blank looks. However, when my mood is better and more lively my messages get taken more readily. I don't know, but I'd guess that if I was just giving out random stuff, and people were reading into what they wanted, then I'd be fairly consistent overall. But I can usually tell when I'm "in the zone" and even when a message under those circumstances is not taken at the time, it is not unusual for someone to come back and say "actually, you were right because we just found out...so and so". You could counter this by saying: well maybe you are just more attuned to normal subtle cues when you are less tired. But examples such as this one tend to belie it: when Jade came to see me following the death of her mother, Lesley, I got the distinct impression of a collection of glass ornamental fairies which she wanted Jade to have. However Jade had no knowledge of this. Some months later Jade came to see me saying that on going through her mother's things at home, they'd discovered a box containing a collection of glass ornamental fairies hidden away at the back of an old cabinet. Now, Jade is my patient, but Lesley wasn't. So how did I get this notion? It's things like that that make me wonder. And I've had quite a few instances of this sort of thing. As regards scientific testing. Well, I've thought of it. But here's my reasoning. While I'm obviously trained in the scientific method, I'm no scientist. And, objectively, whether or not I am versed in science or not would have no bearing on me as a subject. In fact, I reckon I'd be a fairly useless subject because a)I'm hardly the best medium--and I agree with Gary Schwartz who says that if you want to see good baseball, watch the best players b)I tend to over rationalise and this frequently scuppers whatever it is that I'm doing. c)This is a personal journey in the vein of Raymond Moody who in his book "The Last laugh" advocated personal exploration as he felt that more experimentation as unlikely to convince the sceptics or dissuade the believers. d)Time. I'm really really busy at work as a full-time GP with a high caseload and trying to work within the current horrendous changes to the NHS. Hope I'm not being a traitor to Western Rationalism and the Scientific Method, but I think what I have to offer is, hopefully, an articulate account of a journey so many people take. Even if there is no such thing as Psi or the spirit world, it's still a valid account of what I have discovered is a common human experience, which seems to have meaning to many people and could possibly be of therapeutic benefit (which is what Moody says describing his work with mirror gazing in grieving). Ian I am half-way through your book. A very good read! As a Spiritulist of 26years I feel your experience is very valuable and educational. If you do not already belong to the Scientific and Medical Network you may be interested to look this up. Ian-Thank's again for your answers! I take your point about the testing, but I meant more in a sense of testing to 'figure out the process', with a means to making the process more accurate for example, rather then proof orientated studies. I take your points though,even the one about you being a busy GP! Haha. The interesting thing about the example you provided is it rules out telepathy on Jade's part, and super psi is a hard explanation for it, as the intent and desire for Jade to have the fairies was there, which would be hard to explain via super psi. So I find that hard to explain by any normal means I have to say, so I can see why it makes you wonder! Ray-No she didn't thankfully, maybe she searched our names and knows we're connected, so knew not to say that? I'm not sure, it might be worth, me, you and Michael, discussing our readings, and ruling out normal explanations and what not. What do you think? Sorry Ian I have just reached the part of the book where you attend the Scientific & Medical Network Conference. Good stuff - Gary Schwarz is as brave as you! Dear Ian...I just listened to your interview with George Noory on Coast to Coast AM last night here in America. I was fascinated with your story. I too have always been interested in the paranormal. Over the years I have studied, practiced and read volumes on the subject. Life just kind of happened and I've gotten away from it. But your story is so inspiring...motivating me to give another thought to possibly latent "gifts" of mediumship. I've always had some evidence of the paranormal, although like you, I would not go around waving a flag saying look how wonderful of a psychic I am!...quite on the contrary, full of doubt wondering if I am off my rocker, or if there is some validity behind these experiences. The one event I can share with you as an example, is that the Saturday before 9/11 happened I dreamed it vividly! Did not understand the meaning of the dream, but I was compelled to tell everyone I knew about the dream...only to be horrified on Tuesday morning, that fateful day in September 2001...a day I will never forget. There are other examples, but I won't bore you with them here, just suffice to say that your book intrigues me, and I look forward to reading it. C2C is a good place to promote your book, as we are a strong group of dedicated listeners who are open to the paranormal. I hope to meet you one day, and receive the benefit of whatever those who have crossed over in my world or my own guardian spirits have to share. Please keep telling your story, you never know how you might touch someone who needs it and can benefit from what you have to say. Thank you for sharing so openly and candidly about your experiences. Look forward to hearing more and possibly meeting you in person one day. Hello, Ian, I want to second what Cynthia said, it's been my experience too. I'm a semi-retired RN and am considering again taking this path. I guess I thought that since I wasn't 100% with the program that I shouldn't go ahead. Thanks for discussing these issues. Before I got to retirement age I had a dream that people I was traveling with left me in a large airport without money, ID etc. I wasn't worried. I sat down along the hallway and pulled out a deck of Tarot cards thinking that I could always take care of my self in this way. Maybe I should reconsider? I enjoyed your upbeat, candid interview on Coast to Coast. Hope we'll hear more from you. I have been always fascinated by the discussed subject. I believe there are less and more sentient people among us, the more sentient ones might have much stronger intuition and sensations and so they do experience "more" and do this "differently". I myself a couple of times saw dreams about other people which came true later on. Well, it seems that Tru from "Tru calling" and Melinda from "Ghost Whisperer" could exist in a real life too, only in different shapes.